Gentlemen, start your engines! DraftKings is currently hosting daily fantasy NASCAR contests! (Sorry, still no FanDuel NASCAR). The auto racing season in well under way, which means you have yet another avenue through which to win cash prizes. If your football rosters are getting beaten and bruised and your basketball lineups seem powerless in the paint, try your hand at fantasy NASCAR. You may find it’s easier to win contests on the race circuit than it is with daily fantasy’s Big 3 (football, basketball and baseball). Most fantasy NASCAR newbies are unfamiliar with the basics of building winning lineups. If you’re in that boat, you’ll love this quick-start guide. Below, I’ll share my 10 most important tips for rostering drivers who’ll help to put your lineup in pole position. The scoring at DraftKings is relatively simple. There are 3 ways to earn points. The one most people focus on is finishing position. A first-place finish nets 46 points while a 40th place finish nets 4 point. You can also accrue points based on the place differential for each driver in your roster. You’ll earn 1 point for every advance in position. For example, if one of your drivers moves from 20th position to 19th position, you’ll earn 1 point. If he manages to advance to 12th position, you’ll earn 8 points. Keep in mind, the differential also works in the other direction. If your driver has a terrible run, you’ll lose 1 point for each position he surrenders. DraftKings will also award you points for the number of laps your drivers lead as well as the number of laps for which they turn in the fastest times. It’s hard to go wrong putting someone like Jeff Gordon, Kyle Busch or Kevin Hardwick in your lineup. These guys win – or place high in – a large percentage of their races. At DraftKings, the top 4 finishers earn at least 40 points apiece. That’s just for their finishing positions. It doesn’t take into account points earned from the place differential, laps led or laps with the fastest times. As you’d expect, these drivers come with sky-high salaries. That means you’re not going to be able to afford more than 1 or 2 of them. So be ready to look for value in the lower-priced ranks. One way to squeeze maximum value from your lineups is to select drivers who routinely finish in positions 10 through 15. Here, you’re looking for upside. If they have a great day on the track, they’ll advance a number of positions and may even finish in the top 5. You’ll not only earn big points from their finishing position, but also from the place differential. The type of track plays a major role in how drivers perform. Some tracks are short, like the ones in New Hampshire and Bristol. Others are much longer. Examples include Talladega and Daytona. Still others are somewhere in the middle, like the Texas Motor Speedway in Fort Worth and the Kentucky Speedway in Sparta. Insider Tip: On short tracks, it’s a good idea to roster drivers who perform well in the qualifying rounds. Positioned near the front of the pack, they’re more likely to lead a significant number of laps. Plus, if they manage to stay out in front, they’ll have a fair chance of turning in a greater number of fastest laps. On tracks with long straightaways, try to find undervalued drivers who are starting near the bottom of the pack. They won’t have many opportunities to lead laps and deliver the fastest lap times. But they could end up earning a significant number of points on the place differential. From the discussion thus far, you’ve probably figured out why the driver in pole position isn’t always an appealing draft pick in fantasy NASCAR. To be sure, if the pack leader is Harvick or Busch, an argument can be made to draft one or the other. Either might finish in first place. But if the pole sitter is a driver who isn’t normally one of the top 5 finishers in a series, it’s best to fade him. First, unless he’s an elite driver, the chances that he’ll remain the pack leader are slim. Hence, you can’t count on earning a ton of points from a first-place – or even a second or third-place – finish. Second, you’ll LOSE points via the place differential as he surrenders ground. Given those 2 reasons, there’s very little upside in adding him to your lineup. Skilled drivers who do poorly in qualifying races have reason to be disappointed. Their goal is to finish the series in first place. The worse they qualify, the further toward the back of the pack they’ll start the race. That means they’ll have to work that much harder to advance to the front. Suppose Jimmie Johnson performs terribly while qualifying and cements himself in 15th place. You know from reviewing his recent stats that he often places in the top 5. If he manages to do so for the current series, he’ll generate at least 49 points for your lineup. You’ll earn 39 points for his fifth-place finish plus another 10 points for his advance from 15th to 5th (the place differential). That’s in addition to any points he earns from laps led or fastest laps. Lackluster qualifying results shouldn’t be a deal breaker when selecting drivers for your fantasy team. If anything, they should signal a potential opportunity. Knowing your way around stats is a prerequisite to doing well in all daily fantasy sports, from football and basketball to hockey and mixed martial arts. Fantasy NASCAR is no exception. Each one is a scoring category at DraftKings. That makes them very easy to monitor. Note, you don’t need to track these stats over the driver’s entire career. That would take a lot of time and wouldn’t yield useful data. Instead, track them over the last 10 to 15 races. Anything more would be overkill. You should also review how drivers have fared on specific tracks in the past (DriverAverages.com is a good resource for this purpose) as well as their typical qualifying results. Here is a useful NASCAR stats site to reference. NASCAR drivers dread the rain. Wet track means slippage. That, in turn, means hydroplaning, bumping into cars and possibly losing control. That can be a nightmare for even the most experienced and adept pro racers. Most NASCAR races are cancelled in heavy rain conditions. But if the rain is light and the race has already started, there’s an impetus to allow it to continue. From a fantasy perspective, it pays to find out the weather ahead of a series, especially if there’s a chance of rain. Some drivers fare better than others in wet conditions on certain tracks. For example, guys like Dale Earnhardt Jr. tend to outperform the pack when the course is a little damp. That information can give you an advantage over other fantasy team owners. Drivers go through hot and cold streaks just like basketball players and baseball players. If you can catch them when they’re on fire, you stand to earn a substantial number of points. At DraftKings, it’s easy to review a driver’s recent track history. Just check out his race log, which shows his performance in the last 10 races. That’s more than enough information to identify whether a driver is hot or cold going into a series. The Sprint Cup Series is the most important NASCAR series. It’s the one that determines the year’s Champion (it was Jimmy Johnson won in 2016). A quick way to find out a driver’s standing in relation to the rest of the pack is to check the Sprint Cup Series stats. There, you’ll find the top-ranked drivers along with their year-to-date points, wins, top 5 finishes and top 10 finishes. Keep these stats open in a separate browser tab while creating your lineups. That way, you’ll be able to see each potential draft pick’s relative performance at a glance. It’s tempting to focus on how drivers finish series, ignoring other aspects of fantasy NASCAR scoring. That’s understandable. The guys who consistently finish near the front of the pack are safe bets, right? As we noted earlier, there are a number of ways to score points in fantasy auto racing. Finishing position is only one of them. Keep in mind, finishing positions are heavily influenced by factors that lie outside the driver’s control. For example, a slow pit crew can inadvertently sabotage his chances for finishing in the top 5. Top finishing positions are valuable because they deliver a lot of points. But they’re largely unpredictable. 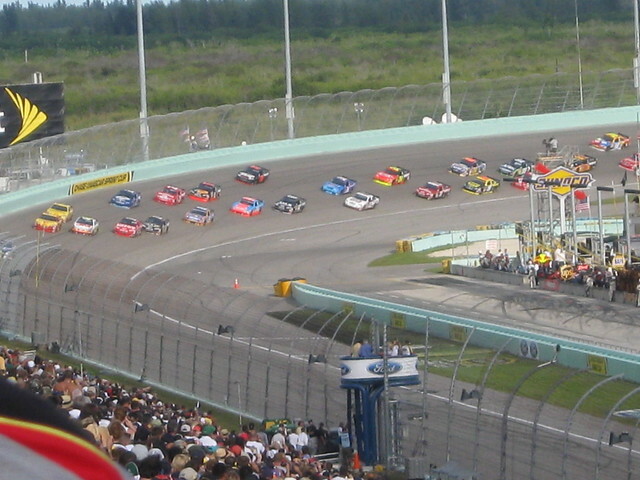 A more reliable fantasy NASCAR strategy is to roster drivers who can deliver a high number of laps led and fastest times while scoring points by advancing positions during the race. Many people who compete in daily fantasy NASCAR aren’t the biggest NASCAR fans. But the contests give them a chance to take a break from football, baseball and other ultra-competitive fantasy sports. They’re able to take a breather and have fun building lineups in a sport that isn’t as fast-paced and aggressive. Whether you’re a diehard NASCAR fan or just want to get a taste of fantasy auto racing, now’s your chance to win real cash prizes. Visit DraftKings.com today and register your account. Make sure you use the promo code “FREAK” to lock in your new-player welcome bonuses. Then, roll up your sleeves and get ready to rev your engine!